In Thailand, 17 Pounds Of Plastic Kills Whale, Highlighting Ocean Pollution Last week, dozens of plastic bags were pulled from the stomach of a whale that researchers found washed ashore in Thailand. 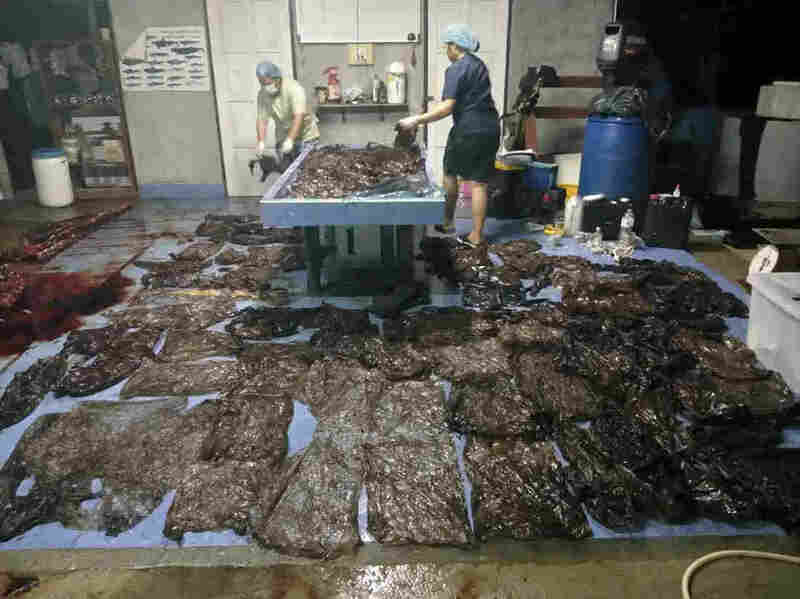 Some 80 plastic bags extracted from within a whale are being laid out in Songkhla, Thailand, in this still image captured from video footage. The pilot whale, which washed ashore in the southern province of Songkhla, later died after veterinarians tried for five days to save its life, according to the country's Department of Marine and Coastal Resources. An autopsy found nearly 17 pounds of plastic inside the whale's belly, a marine official told Reuters. The whale's death and photos released by the department serve as a reminder of a growing global problem: plastic debris flowing into the ocean and killing wildlife. "We are creating the horrible dystopian future that nobody wanted," Enric Sala, an explorer-in-residence and marine ecologist with National Geographic, tells Here & Now's Robin Young. Scientists at the Thailand Department of Marine and Coastal Services told Reuters the plastic probably ended up in the whale's stomach because he mistook it for food. "Whether it's a straw or whether it's a bottle cap, those items can be eaten by animals, and they pose threats through getting stuck in their digestive tracts. It can tear their stomachs," Nick Mallos of the Ocean Conservancy told Young last month. "So these products in their entirety are problematic, but what's equally, if not even more, concerning is that over time these materials are in the ocean, they begin to break up into smaller and smaller pieces." Some are seizing on the whale's death to convince Thailand to take steps to reduce the use of plastic bags — either by taxing the companies that make them or taxing the consumers who use them. "We will use the whale case and invite all sectors to show their intentions on how to reduce the use of plastic in Thailand," Jatuporn Buruspat, head of the Department of Marine and Coastal Services, told Reuters. A study in the journal Science found the top countries that "mismanaged plastic waste" in 2010 were in the Asia-Pacific region and included China, Indonesia, the Philippines, Vietnam, Sri Lanka and Thailand. Last year, researchers discovered the highest density of garbage in the world on Henderson Island, a remote, uninhabited island in the South Pacific. The study also found that 8 million metric tons of plastic enter the ocean every year from land. "Every minute [there] is the equivalent of a garbage truck full of plastic going into the ocean," Sala tells Here and Now. "The problem is so huge, but the solution is easy. We can stop plastic from getting into the ocean, and this has to happen at different levels." Prime Minister Theresa May has called for legislation banning straws and other single-use plastics. In Canada, plastic straws have already been banned in Vancouver, and similar efforts are underway in Scotland, Taiwan and Malibu, Calif.
Sala says people have become too comfortable with single-use plastics that they don't need. Experts are encouraging people to look at alternatives like canvas bags and glass, metal or paper straws. Despite how pervasive they have become, bags only make up less than 10 percent of all plastics imported into the U.S. in 2016. "This is [a] very small part of our economy, yet every year, people use trillions of plastic bags around the world," Sala says. "And all this plastic ends up killing a million sea birds and 100,000 marine mammals like that one pilot whale that was in Thailand. The problem is that most of these animals die with nobody knowing."